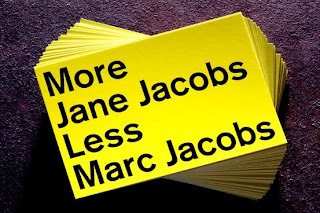 After spotting his bright yellow "More Jane Jacobs, Less Marc Jacobs" postcard in the Soy Luck Club cafe on Greenwich Avenue yesterday, I contacted graphic designer Mike Joyce of Stereotype Design and asked some questions about his recently launched, pitch-perfect "guerrilla campaign." The Village has been turning into a luxury shopping mall for years now. What was the last straw for you, the impetus that drove you to launch this campaign? I moved here in '94 (I know, I missed the Village heyday by about 30-40 years) and loved just walking around desolate areas like the Meatpacking District (a crazy time when they actually packaged meats) or finding an old garage on Washington being used as a makeshift bookstore. I guess what finally did it for me was watching about twenty of my favorite restaurants going out of business or being driven out by rents doubling and tripling. This is a sad and direct effect of the franchises like Starbucks, Ralph Lauren, and Marc Jacobs moving in. The management companies like Gottlieb and Ripco have a new client to cater to and it definitely doesn't include the independent small business owners. Biography Bookshop on Bleecker is leaving to make way for another Marc Jacobs store. You say on your website that Greenwich Village is your “client” for this campaign. What kind of client is the Village and what are its needs? That was just a way to be consistent on my site and fit it in with all the rest of my projects that truly are created for clients. But if the West Village was a client of mine, first of all they'd have no money, and secondly I think they would really be into this message. The perfect pro-bono client. I’ve written before on the proliferation of Marc Jacobs stores along and around Bleecker and their effect on the neighborhood. Sometimes, I get comments like this one in his defense: “the guy is a local NYer who started out working in a consignment shop in the east village during the 80's.” How do you respond to the argument that, because Marc Jacobs started out small and local (he’s also a native New Yorker), his saturation business model should not be critiqued? Ya know it's funny, when I started this I thought I would get a ton of comments like that but it's really been completely the opposite. Everyone seems to really enjoy the sentiment of the card and I've seen them propped up in store windows and counters and even pinned on an old lady sitting on a bench on Hudson Street. Probably the biggest question I am asked is "Who's Jane Jacobs?" But I definitely understand that counterpoint and to those people I have two things to say. One, it is absolutely not meant to be a personal statement against Marc Jacobs. I actually like some of the store's window displays and think he and his team are really talented designers. And two, don't be so literal! It's a play on words to reflect the Village being taken over by franchises and chains of all kinds--not just the six Marc Jacobs stores. Oh, that would be my third point, there is of course a place for Marc Jacobs in the Village but six stores on two blocks?! Come on, the person that argues for that has no individuality. What’s the next step in your guerrilla campaign? Will there be t-shirts, baseball caps, posters, performance art pieces? I like the idea of performance art. Maybe we can reenact the last scene in Do the Right Thing? I was originally going to do stickers but I hated the idea of people plastering them on store windows and street signs, so I went with the less obtrusive postcard. But I'm definitely doing t-shirts! I think I'm going to do a reverse of the card--yellow type on black tees. And pins too--the kids love pins these days. I'll let ya know when they're out. Where can people get their hands on some of these postcards if they want to help in the distribution? A few people have contacted me for this and I'm more than happy to give a handful of cards out free of charge--just e-mail me at Stereotype. I'll definitely be reprinting more! I actually remember that old makeshift-bookstore-that-was-formerly-a-garage. That's not even that long ago. Excellent interview! I really like Mike Joyce. A good one! Reminds me of this summer when the city named the block on Hudson Street where Jacobs lived "Jane Jacobs Way." Save Coney Island folks showed up at the ceremony disguised in Jane Jacobs wigs and eyeglasses and carrying eye catching posters that read "Jane Jacobs would have saved Coney Island." Chrstine Quinn had to acknowledge them in her little speech. Sadly, parts of Bleecker and West Fourth Streets have turned into Marc Jacobs Way and Marc Jacobs Lane. I try to avoid walking on those blocks. How about a T-shirt? Maybe Marc Jacobs would pick it up for his store(s). mike assures me that t-shirts are being ordered as we speak. whether or not jacobs wants to carry them in his store...well, that would probably be good PR for him, and a very weird ironic twist. 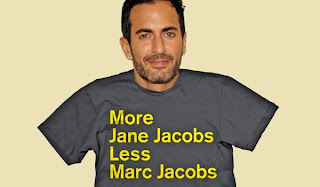 More Mike Joyce less Marc Jacobs! Yuck. A publicity stunt for a PR type. An appropriate post to see as this reader makes good his escape from NYC. JVNY and its fellow travelers have been blog-havens from the storm, and one looks forward to keeping up with them from wherever one lands next. hoover, where are you escaping to? You should open up a shop to sell the shirts and stuff! Oh, and you should carry some cool design stuff as well. I love the font you used, you should sell silk screened posters as well of the design, and cool old vintage things! I would totally shop there! I saw the More Jane/ Less Marc sign held by someone that passed me on Bleeker St. I felt compelled to find out who thought of it. It's a clever and sad comment on the state of affairs where I've lived for 30+ years. I can't figure out why there are always lines waiting to get into the Marc Jacobs store on Perry & Bleeker. Now, cupcakes I can understand...but this stuff? Please someone enlighten me. Are they tourists off the bus? Who is telling them to cue-up like that? for reasons unfathomable to me, people love to stand in lines, just for the sake of standing there. i think it makes them feel included in something. This furthers the myth that Jane Jacobs did her work in and about New York. She didn’t. She started there and moved to Toronto. i bought my first jane jacobs book in biography books. how's that for apropos?